I have been sitting on this container of home-made lard I acquired a couple of weeks ago. I gingerly pried the container open last weekend and scooped out a tablespoon or two for my first foray into its use: refried beans. I don't know if it was because I knew the lard was in there, but they were especially delicious, I have to say. While it was heating in the skillet it gave off a faint hint of bacon or, more appropriately I suppose, pancetta, but I did not detect the slightest trace of it in the beans themselves. But everything about them was better - the texture, the flavor, the consistency - I think that alone was enough to convince me that lard is something I want to have around the house on a regular basis. And then this weekend I thought I would give it a stronger test. I decided to make my flaky whole wheat biscuits with lard instead of butter. It was another resounding success. For one thing, the lard was much easier to cut into the dry ingredients than the butter. Because it is solid at room temperature, you don't have to worry about keeping it ice cold the way you do with butter, so it doesn't require as much elbow grease. It rolled out just as easily, and the cutter sliced through the dough "just like buttah," if you will pardon the phrase. 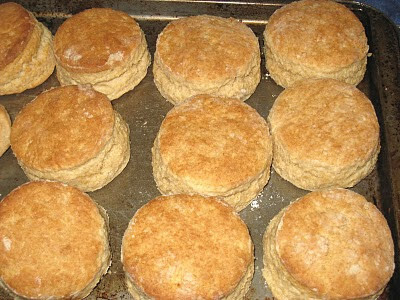 These biscuits may not have risen quite as high as the biscuits made with butter, but they were much, much more tender, and just as flaky. There was no hint of pork or bacon in them, just good solid biscuit flavor. I highly recommend you find a source for this lovely fat, and get you some post-haste. It keeps for quite a while in the refrigerator, so you don't have to worry about having to use too much of it. I am 99.9% convinced. The final test is yet to come. Next, I take on pastry dough. I think something savory would be best. Time for more empanadas!